French President Emmanuel Macron’s EU reform ideas are a central issue between CDU, CSU and SPD while discussing European affairs during the German coalition talks. For Macron, the outcome might be of crucial importance when it comes to the realisation of his plans. EURACTIV Germany’s media partner Der Tagesspiegel reports. Every day of the talks has a major theme, to which the small group of party and faction leaders devotes themselves. On day two, the future of the community was on the agenda. The plan was to keep everyone quiet during the five negotiation days. But on Monday, a steady stream of whispers from the working groups working in parallel with the bosses on 14 agreed subjects became public. The intended silence did not work. Thus, the audience learned that CDU, CSU and the SPD no longer consider Germany’s national climate protection target for 2020 to be achievable. Another silent message was delivered by the first agreement of the tax and financial working group: In the future, the top tax rate of 42% will only apply to incomes above €60.000 instead of the current €53.700. That is not surprising at all. Both, Christian Democrats and SPD want to relieve skilled workers. Although the higher limit does not bring great relief to the individual, it symbolically reduces the bad feeling that even the man working on the automobile production line is treated as a top earner by the state. Europe is a central topic for two of the negotiation partners: Party leader and European-by-heart Martin Schulz recently declared progress in the European integration one of the main concerns for the SPD. On the other hand, the CSU in general and the smaller circle around state group leader Alexander Dobrindt in particular pursue a rather sceptical stance towards ‘Brussels’. 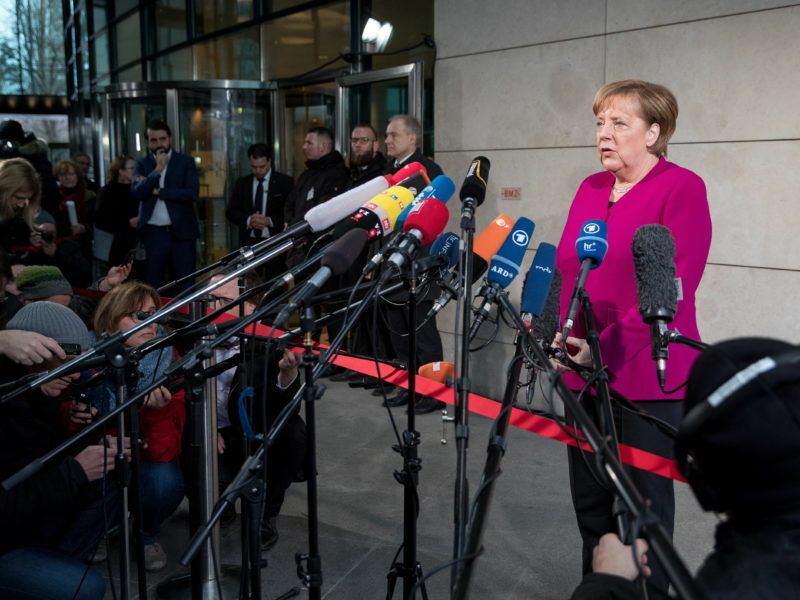 Germany’s would-be coalition partners have agreed to drop plans to lower carbon dioxide emissions by 40% from 1990 levels by 2020, sources familiar with negotiations said on Monday (8 January) – a potential embarrassment for Chancellor Angela Merkel. In between, there is the Chancellor. Angela Merkel wants to give an answer to Macron about his reform proposals which does not consist only of ‘no’s’. With the SPD, this might be easier than in the Jamaica quartet with FDP leader Christian Lindner, who rejected the compromises of his own European affairs experts. 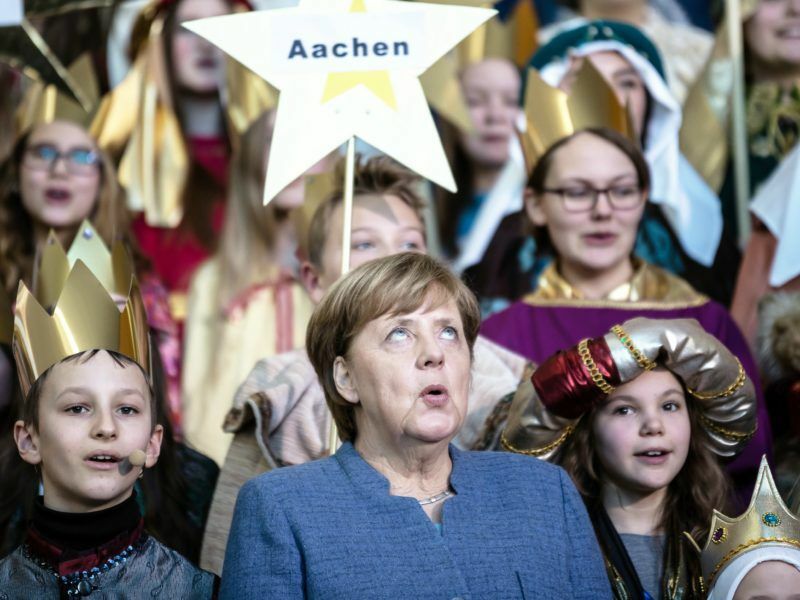 Now, it is rather Merkel who will have to decelerate. Macron here might belong to the group of non-German politicians having a special interest in the negotiations of the European affairs working group. Because the French President is urgently seeking allies for his reforms – and knows that he depends on the German Social Democrats. 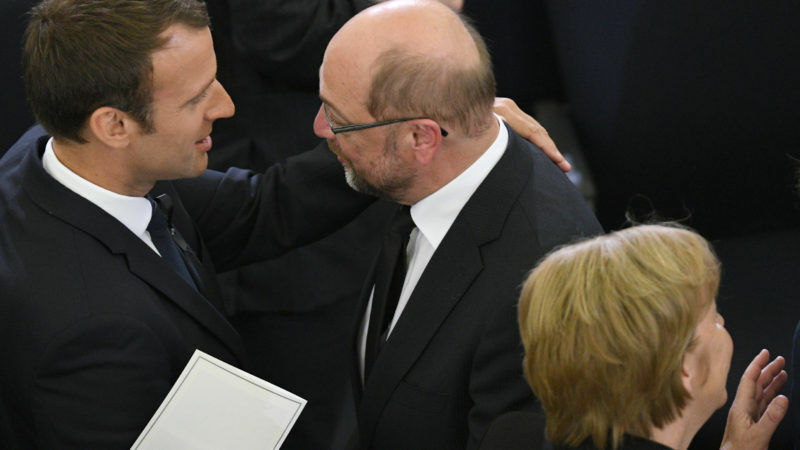 After the end of the Jamaica talks, Macron urged Schulz repeatedly to enter a grand coalition and take responsibility for the future of Europe. For the SPD leader, who supports Macron’s ideas and cultivates good contacts with the French president (“My good friend Emmanuel”), an agreement with the Christian Democrats on further EU development is important as well: Being a long-term president of the Parliament, he can credibly lobby for the fact that the grand coalition is not only about the fate of the SPD, but also about the future of the European project. Nevertheless, the transformation of the EU into a ‘United States of Europe’ by 2025 – as Schulz has demanded during a party congress in December – is not a demand pursued by his party in the negotiations. In its congressional decision, the SPD demands “concrete and substantial progress on the way to a social Europe”. Together with France, the German government must take the initiative for an investment budget for the Eurozone. A “broad-based European investment program”, the introduction of European minimum wages and the drying up of tax havens would be needed. Because of Brexit, the fight against flight causes and the development of a common security and defence policy, the EU would need more additional resources on its own in addition to more financial resources from national budgets, the Socialists predict. The SPD negotiators have looked closely at what CDU/CSU had agreed on Europe in the Jamaica talks with the FDP and the Greens. Strengthening the Economic and Monetary Union and “adequate” investment was mentioned in the protocols. However, at that time, the Liberals rejected Macron’s proposal for a separate eurozone budget to finance future investment and emergency aid for countries in economic crises. The FDP back then blocked out the sentence saying that even if there was no automatic transfer or debt consolidation, it would still be necessary to cushion emergency situations in individual EU states.